Improved screw-in insulator with unique advantages over traditional black screw-in insulators. Much stronger due to the new technology. More robust due to the metal core. Chance of short circuit is zero due to new design. Suitable for (poly) wire in combination with wooden post. Low-priced, high quality screw-in insulator without metal core. Suitable for wooden posts. High quality screw-in insulator without metal core, therefore no short circuiting possible. For adding a wire to a wooden fence post. Type 009008 also suitable for 12,5mm tape. 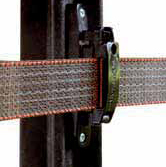 Insulator with soft faces to lock the tape between two rubber sleeves (patented system). Fixes the tape with 1 click and prevents wearing guaranteeing a long life for your tape. Additional screw can be used to tighten the insulator even more. The new very innovative robust Corner Insulator. Has a lot of advantages compared to the traditional insulators. A unique subframe for optimal strength and fixation at the post. Pre mounted rubber grip for best tape fixation. Can be installed with only one drill bit. A unique slot to strain and restrain your tape. The optional metal plate (art. 708027) can be used as a tape connector and gate anchor.